Hello. It's my day to post at Sweet Pea Stamps. I like to show you today card i made with gorgeous stamp by Mitzi Sato Miuff "Hydrangea Sprit". 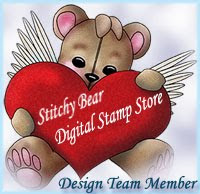 This image you can find only in rubber stamp, and lots more. I used Aqua Color pencils for coloring. I really like this pencils and have only pack of 12. So i better go shopping for more. Here is some of my embellishments. I added sentiment on the inside, and this card will go to my good friend. Oh, how I love the colours in this card and your delicate lacy die cuts and gentle sparkle complement your beautiful, delicate image to perfection. Your special friend is going to feel Very special when she receives this wonderful card.